Sitting volleyball (sometimes known as paralympic volleyball) is a form of volleyball for disabled athletes entered the Paralympic Games as a demonstration sport for amputees in 1976 in Toronto, Canada and played as a medal sport thereafter. 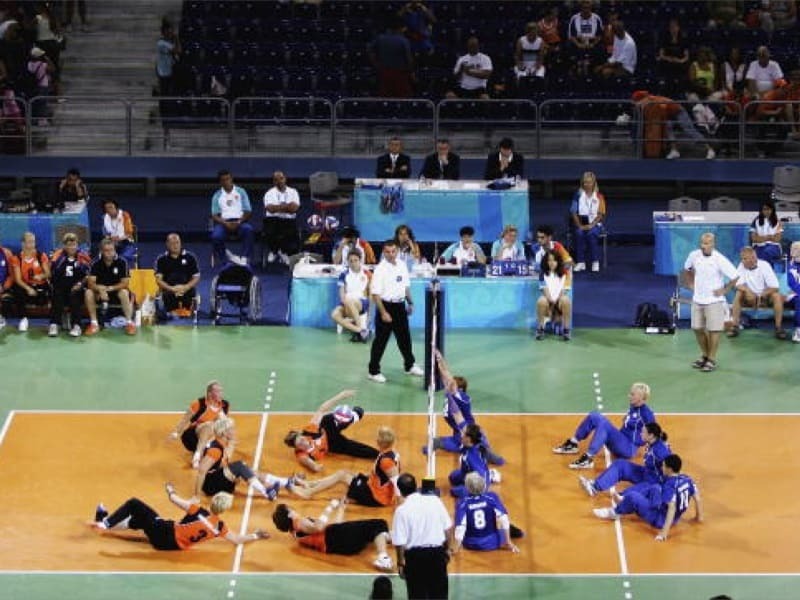 In sitting volleyball, a 0.8 meter-wide net is set at 1.15 meters high for men and 1.05 meters high for women. The court is 10 x 6 meters with a 2-meter attack line. Players must have at least one buttock in contact with the floor whenever they make contact with the ball. It is also possible to block the serve and jousts are generally replayed. Athletes with the following disabilities are eligible to compete in sitting volleyball: amputees, spinal cord injuries, cerebral palsy, brain injuries and stroke. There are no athlete classifications by disability.